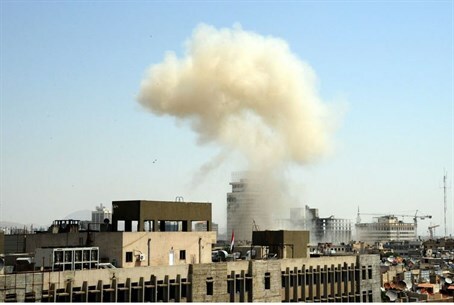 Two bombs struck a large military airport outside the Syrian capital of Damascus on Sunday night, the main rebel army said. Two bombs struck a large military airport outside the Syrian capital of Damascus on Sunday night, the main rebel army said, according to CNN. The first of a series of explosions was near a checkpoint near the main door of the al-Mazzeh airport, and the second was near an exterior wall, said Louay Mikdad, a spokesman for the Free Syrian Army. It wasn't immediately clear who was behind the blasts. It was not known how many people were hurt, but Mikdad said witnesses told of "many ambulances" taking away the wounded, CNN reported. Al-Jazeera reported 12 dead. After the explosions, mortar bombs were fired from inside the airport into surrounding neighborhoods, Mikdad said. The targets weren't known. In addition to being the site of the military airport, the al-Mazzeh area is home to embassies, security buildings and the homes of some members of Syrian President Bashar al-Assad's inner circle, according to opposition activists.